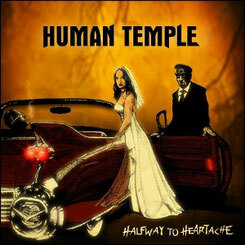 Finland's premier melodic hard rock Human Temple will release their 3rd album “Halfway To Heartache” from Escape Music on February 24, 2012. The album “Halfway to Heartache” has 11 tracks of brilliant tunes that range from quirky rockers to powerful ballads. Emppu Vuorinen from Nightwish is featured as a special guest musician in the album. It is available at amazon.com. Also this album will be released from Rubicon Music on March 21, 2012 in Japan.